Fiction writer & Faber Academy alumna. Enjoyed the unseasonably good weather in February 2019? Wondering what this means for our planet? 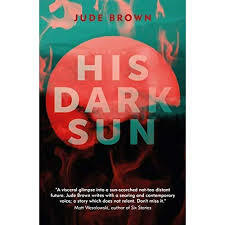 Set in 2022, His Dark Sun by Jude Brown, explores this timely question. The globe has heated up to uncomfortable levels but fire-starter, Luke Spargo thinks he is the only one who has all the answers to save the planet, except his methods are dark and sinister. Believable characters I cared about – a gripping read from an accomplished award-winning writer.